Mixed media acrylic on canvas with paper, fabric, Swarovski crystal, acrylic gemstones, foiled paper & glitter. Meditating on the achieving peace and enlightenment in this lifetime through unconditional love, appreciating and practicing compassion toward oneself and others equally, follow the Noble Eightfold Path. 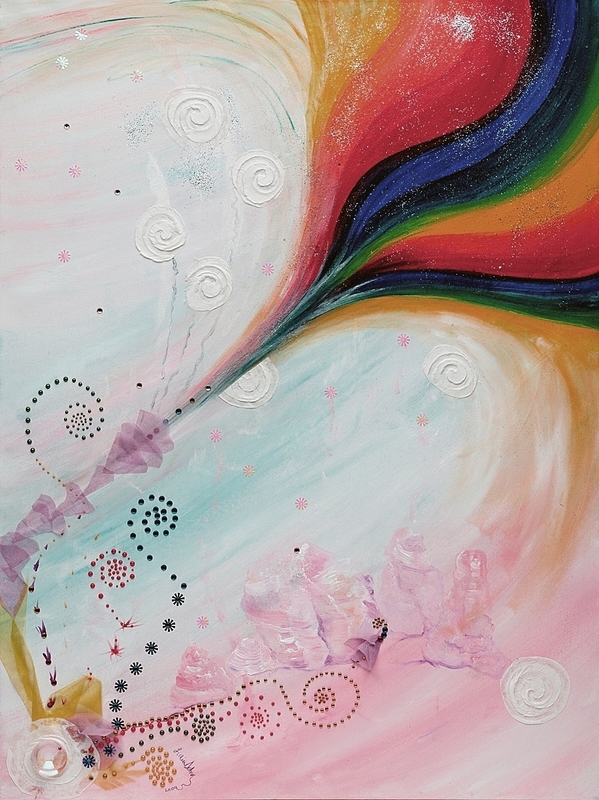 This painting is full of meaning.The stars have 10 spokes symbols of the Ten Paramitas.The white concentric circles symbolize the Noble Eightfold Path.The large pink quartz crystal is Amitaba, the Buddha of Infinite Light.The rose-colored beings on the bottom are reminiscent of rose quarts, the crystal symbolizing self-love & appreciation for all with total equanimity.The 7 concentric spirals unfolding, symbolize the 7 jewels of a Bodhisattva: faith, integrity, non-attachment, learning, discrimination, modesty and conscience.The huge double rainbow unfolding represents the 3 kinds of generosity: material, spiritual and the teaching of the Dharma by sharing of ourselves and shining the light through meaningful discussions beneficial to all; and encouraging others to explore and practice as we walk the talk.